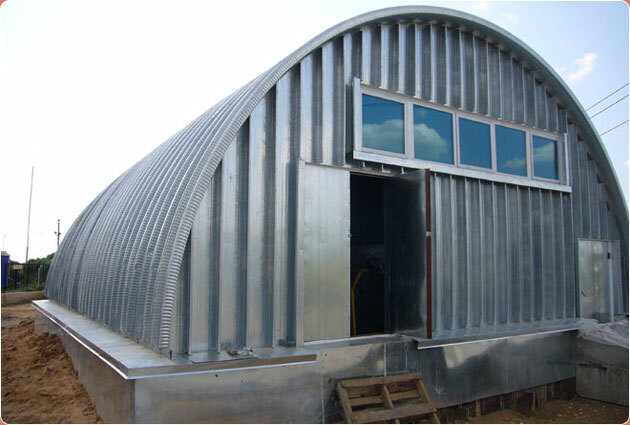 The hangar is a place to store grain and other products, the design need to buy, you can build yourself. Now invented the latest technology frameless construction. They are good because their Foundation much easier. Additionally, technology will allow the use of galvanized arches. Frameless hangars are very resistant to wind, snow and moisture. They are waterproof and fireproof. You will need a large number of tarpaulin fabric. To wear the old remnants of fabric or already used material. Scraps stitch between to form a dome. Then soak a cloth with a special solution to make it waterproof. Put stitched dome 40 percent solution of soap. After the fabric is thoroughly soaked, remove it from the solution and move in a 20 percent solution of copper sulfate. Let the fabric soak and then remove and dry thoroughly. Manufacture the Foundation of the hangar. To do this, purchase the required number of coils of galvanized steel, which is specified in your terms of reference. From rolled galvanized steel fabricated arches and connect them with each other laminate sealed seams. Install arch on the supporting frame. Mount the arch hangar and install the gate. To cover the use of specialized flooring. For insulation on top of the corrugated sheet install sandwich panels with different fillings. Over the coating lay your canvas fabric soaked in a special solution. Pour a concrete floor or line a rimmed construction materials as desired.